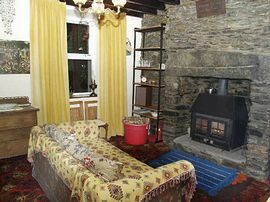 A mid-terraced Slate Miners Cottage nestled on the lower slopes of the Moelwyn Mountains from where you get wonderful panoramic views. There is one bedroom with two sturdy bunk beds that will sleep four adults. The cottage has been refurbished keeping many of the original features which include stone walls, inglenook fireplace, wooden beams. 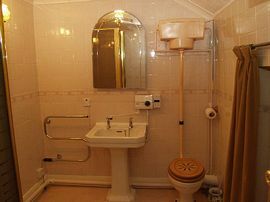 All the basic facilities are there to make your stay comfortable. This is TV and phone-free cottage. Bring your own portable TV. Mobile phones can be used in the cottage but performance depends on the service used. The garden has a walk-through Rhododendron tree which attracts many varieties of small birds. Hill walks and rock climbs are on your door step, you do not have to drive to get there. There are many local attractions including Llechwedd Slate Caverns, the oldest narrow gauge railway, a hydro-electric tourist attraction. The Italianate village of Portmeirion is 7 miles away. Lots of other adventure activities are within a 20 minute drive. Log-burner with free wood provided. Bed linen can be provided for an extra charge of £5 person plus £2 for towels per person. The cottage has a garden and a paved area for barbeques. 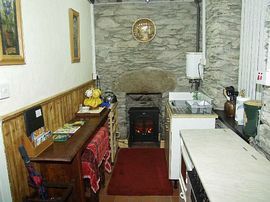 Local Services: Tanygrisiau has a post office approximately 400 yards from the cottage and there is a tourist cafe close by. Shops, restaurants, pubs, take-aways are in Blaenau Ffestiniog 1.25 miles away. A bus service runs once an hour during the day or take the steam train from Tanygrisiau station. 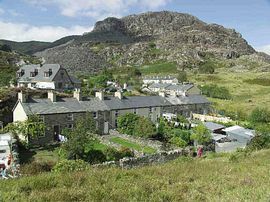 Tanygrisiau is approximately 2 kilometres south of Blaenau Ffestiniog. The local bus from Blaenau stop is 150 yards from the cottage. The easiest approach by car from Blaenau is to head toward the Hydro-electric Power Starion and take the back road heading up to the dam. If you travel by the narrow gauge steam railway to Tanyrisiau station you will be able to walk to the cottage. The same low tariff applies all year. Book early to grab bargain peak season dates. Tariff according to size of party (sole occupancy). An extra charge is made for electricity used at 15p per unit. 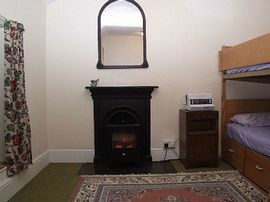 "fantastic location", "cosy", "good place to chill out", "lovely, homely cottage".